Active Components: Hops are rich in bitter components. The main bitter components are called lupulone and humulone. These components are believed to take responsibility for the known capacity of Hops to increase appetite. Hops are also reported to include volatile oils in 1-3% concentration. History: It was in XVII century that hops became popular in England and has since been used as part of medical preparations and as a beer constituent. Early American residents used its flowers to produce a calmative effect on the body, they also used warmed up dry blossoms to reduce toothache. Used For: The herb is successfully used for such conditions like insomnia and anxiety. It is additionally known to reduce fevers, calm the nervous system, induce urination, and reduce pains. Hops are stated to produce a mild calmative effect. A wide range of sedative preparations, especially those for insomnia, contain hops along with popular sedative components, like valerian. Hops primary application consists in using the herb as a sedative remedy for the nervous system. Hop tea is prescribed for restlessness, insomnia, and nervous diarrhea. It is also beneficial for bowel pains, fight meteorism, and increase appetite. It may be successfully mixed with valerian for nervous conditions accompanied by spasms. Tea, taken cold, is better drunk an hour prior to food intake, to improve digestive functionality. Due to its potency to increase urination, hop is applied in case of urinary conditions, associated with excessive uric acid levels and liquid retention in the organism. Adding hops to the pillow was believed to relieve sleeplessness (for this aim hops were mixed with alcohol and put into a small pack to be put to the pillowcase). Additional Info: The herb is indigenous to North America, Asia and Europe. It’s a climbing plant which bears cone-resembling strobiles which are commonly raised and gathered from the female specimens. 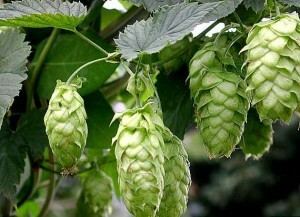 Hop is primarily applied as an additive in beer production, being a popular flavor. The herb belongs to perennials and may grow up to 30 feet in length. Male specimens bear small green-colored flowers, which appear in midsummer and blossom till its end, with female flowers being pale green, and producing green strobiles, rounded by yellow glands, which contain bitter constituents. Preparation and Intake: To prepare tea from dried fruits, take 1-2 teaspoons of the fruit and aid them by 150 ml of boiling water. Infuse for ten to fifteen minutes prior to application. In form of tincture the remedy is used at a dose of 1-2 ml twice or thrice a day. Pills, containing dried hop, are used in a quantity of 500-1000 mg twice or thrice a day. Lots of herbal remedies include hops in conjunction with other herbal remedies like skullcap, passion flower, and valerian. Safety: The herb is listed as safe. No side effects have been reported, moreover, the herb can be safely used in conjunction with other remedies. Still, anecdotal cases of skin allergy to hop flowers have been reported due to handling the plant. It may be explained by sensitivity to pollen.